The conclusion to the sweeping epic that began in 'TO JOURNEY IN THE YEAR OF THE TIGER, the story picks up where Journey leaves off, in the harsh deserts of Khanisthan. The team is running under a very set of different dynamics than before, for not only will they be forced to confront enemies tracking from the North and a hostile force from the Palace following from the South, but they must face their own demons that are plaguing them from within. It's man against man, cat against cat, Seer against Alchemist, knowledge versus ‘the Way of Things’ – a Sci-Fi 'Pride and Prejudice and Lions', like you’ve never read it before. This is the journey of six individuals as they travel beyond the edges of the known Empire, into lands uncharted and wild. Theirs is a journey of magic and mystery, science and swords, romance and intrigue. It is a journey of different perspectives and unexpected kharma and love found in surprising places. It is a journey that takes place five thousand years or so in the future, naturally in the Year of the Tiger. 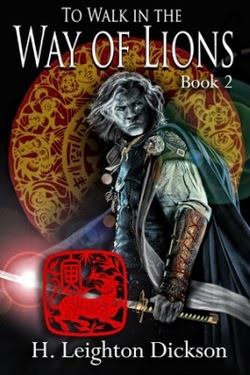 To Walk in the Way of Lions takes everything I loved about Book 1, To Journey in the Year of the Tiger and manages to make me fall in love with the world and characters all over again. I've laughed, been saddened, felt anxious and let out great happy sighs. Dickson's places and characters are immersive and addictive. I'm so very glad there is another book in the series. Again, I find myself wanting to say so much my voice feels blocked by the sheer volume of things to say. These stories continue to be amazing, the characters touching and relatable and the adventure so encompassing all I can express is the fantastic experience spread through Dickson's pages.